LANCASTER, Penn. – March 14, 2017 – Known worldwide for their biblical spectaculars on a panoramic, 300-foot stage, Sight & Sound Theatres® will launch the life story of Jesus for the first time in its 40-year history. Jesus is an action-packed musical stage adventure – a journey alongside the most important person to ever walk the earth, and the everyday people whose lives he transformed forever. 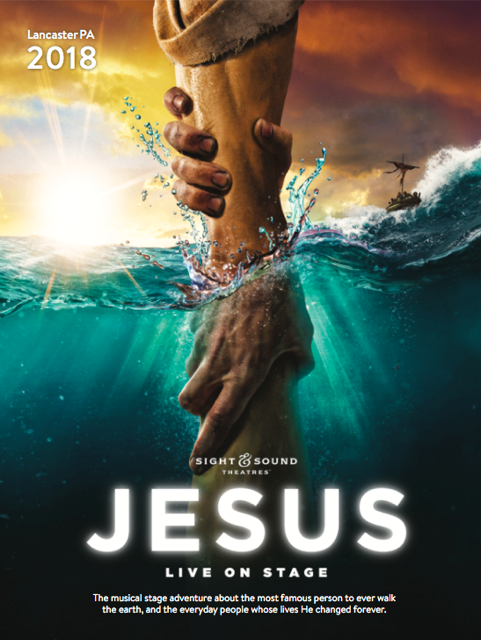 Following the 2017 return of Jonah to Sight & Sound’s 2,000-seat theater in Lancaster, Jesus debuts March 10, 2018, and runs through Jan. 5, 2019. Audiences will experience the story amidst a three-sided stage enlivened by one of the largest, state-of-the-art LED screens in a theatrical venue—along with Sight & Sound’s famous animals…on stage and in the aisles. Jesus’ story may be familiar but his actions still surprise us. He befriends outcasts and heals the hurting. He challenges social norms and confronts hypocrisy. He sets sail with fishermen and reasons with religious scholars. The lives he touches are never the same. From the streets of Jerusalem to the raging Sea of Galilee, no place—and no person—is beyond the reach of his love. March 10, 2018-Jan. 5, 2019. Will there be a Jesus show in Branson Missouri at sight and sound theater. We are looking for the schedule at “Sight and Sound” during April 2018, at the time of the Jubilee at the Welk Theatre. . We are hoping for :”Jesus”!!!! i want to purchase tickets for the Jesus showing in March. having difficulty trying to find the site to purchase them. how long is the show…30 minutes, one hour, two hours or six hours..somehow i’m not able to get this info from website. Recently saw Jesus in Lancaster Pa. It was fabulous. I recommend it.